Almost Free Money?? Where do I sign up?! Are you looking for a fun way to make some extra cash and make ends meet? Would you like to launch your own home business with very little start-up costs? Are you a stay-at-home parent or retired senior looking for financial freedom? Are you already an internet seller who is bored with the selling the same old crap or tired of competing with other sellers for inventory? Looking to increase your profit margins on selling used items on the internet? Would you like to know how to save your family money by learning about many items that you can sell that most people throw right into their trash cans? Almost Free Money provides solutions to all of these problems facing many people in our current economic condition. This 119-page document (which is all information content, and no extraneous illustrations) is a compilation of ten years of research into materials that can easily be found in any location around the world for free or under $1. The book teaches readers methods for effectively reselling items online on eBay and at the Amazon marketplace with extremely high profit rates. The author has successfully used the research relayed in this book to locate and sell over 12,000 items at an average profit of over 500%. 1. Learn how to get your hands on tons of free items and materials that can be sold on the internet from home, or at physical locations if you prefer. Readers are provided with appendices containing over 520 such items, and the eBay categories where the items may be listed for maximum profit. Identify items that already exist in your home that can be sold for great money. 2. We will take a tour through your home and property and discuss items that can make you money instantly! 3. Find gold, silver and platinum for free in a variety of sources. Gold currently has a spot price of about $1700 a troy ounce. 4. If you are an internet seller, and only selling on eBay, you are missing the boat! You will learn where to effectively sell your treasure. 5. Learn what to look for while you are at garage sales, thrift stores, and flea markets. 6. 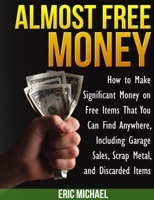 You will learn how to sell scrap metal - the ultimate free money. You will take a virtual trip to a scrap metal dealer. Selling scrap is easy and fun. 7. Launch your home business for peanuts, and organize your business effectively, including record keeping and income tax issues. 8. Learn how to research on the internet, the most important skill for an entrepreneur. 9. Make money from home at any time of the day or night. You will build an inventory and make money while you sleep. 10. Find inventory anywhere in the world. Anybody can do this! We are confident that you will enjoy the accounts of finding treasure for free, and benefit from the information provided in this book. Come on and in and join several thousand fellow savers, garage sale shoppers and scrappers who have ordered Almost Free Money. 5.0 out of 5 stars A creative way of making some extra cash! "When I saw this book I was very curious to find out how people can make extra money by selling things they can get for free. It sounded too good to be true, but now I know it is possible, easy to do, and, more importantly, anyone can start their own business like this. I like the fact that the author talks about his own experience and gives details on how he started his business and expanded it. The book is very well structured, easy to read, enjoyable and motivating. It's a great guide that explains all the steps you need to take in order to find items that people would usually throw away, and sell them on eBay or Amazon. The author also gives a huge list of items that can bring a generous income, but the best thing is that it teaches the readers how to find their own items and become experts at spotting something that would bring them money."